While heavy commercial trucks played a part in about 10 percent of Colorado’s fatal auto accidents in 2016, those accidents resulted in the deaths of 14 percent of the people killed in accidents that year. Only 21 percent of those killed were riding in the trucks. The rest were in other vehicles, riding bikes, or on foot. Recent regulations proposed by federal agencies to make people safer have been delayed, withdrawn, or reversed under President Donald Trump. And no significant safety rules have been approved since Trump took office according to an investigative report by Associated Press transportation writers Joan Lowy and Tom Krisher and published by USA Today. The dozen repealed rules were meant to make future cars safer, slow speeding 18-wheelers, and make sleepy railroad engineers alert, to describe a few. Most of the rules were opposed by powerful industries, the report says. The people running the agencies are mostly political appointees who were leaders in the industries they are now regulating. The occurrences follow Trump’s promise to eliminate regulations throughout the federal government that some see as unneeded limits on economic growth. U.S. Department of Transportation (DOT) head attorney James Owens told the Associated Press that new administrations typically review agency regulations upon taking office. Trump’s DOT will not enact new regulations simply because they’ve gone through most of the lengthy process for adoption, he said, if, for instance, they unjustifiably harm safety, or create high economic costs. Government leaders sidelined a proposal requiring new cars and small trucks to be equipped for connected driving. The technology allows nearby vehicles to exchange information such as their locations, speeds, and directions wirelessly so they can better avoid collisions. Although some consider connecting vehicles as one of the best developing technologies for reducing traffic deaths, the current administration has moved the proposed rule from its list of active rulemakings to its long-term agenda. The shift means it will not be enacted before October, if ever. The National Highway Traffic Safety Administration is still reviewing public comments on the proposal and has made no final determination. The White House has also delayed enforcement for at least one year of a 2016 rule requiring new hybrid and electric vehicles to make noise to replace absent engine sounds and alert pedestrians and bicyclists. Although the government estimates the noise requirement would prevent thousands of serious pedestrian accident injuries, it was delayed after two auto industry trade groups petitioned the DOT to give them more time. New electric-drivetrain cars will not need to growl, purr, hum, or varoom before Sept. 1, 2020. The White House has delayed a 2016 DOT proposal that would have required new heavy trucks to be equipped with speed-limiting systems. The item, which moved from the agency’s shortlist to its long-term agenda, might have limited truck speeds to 60, 65, or 68 mph. Each year, about 1,100 people die in commercial-truck accidents on roads with speed limits greater than 55 mph. Two years ago, DOT estimated that the rule, each year, would save nearly 500 lives and save the American economy between $475 million and nearly $5 billion, depending on which speed limit was designated. DOT says the proposal is still alive, but the department has limited resources and higher priorities to pursue. The American Trucking Associations (ATA) trade group supported the proposal in 2016 but later opposed it, saying it would create dangerous differences in car and truck speeds. Chris Spear, ATA president, met with Transportation Secretary Elaine Chao shortly after she took office and met with President Trump in March, then took credit for stopping the speed-limiting proposal. DOT withdrew another early-state proposal that would have required commercial truck and bus drivers, as well as train engineers, to undergo screening for sleep apnea. The sleep disorder, which can cause drivers to nod off while at the controls, has been blamed for a number of serious train, truck, and bus accidents. Just How Deadly Are Heavy Trucks on Colorado Roads? The Colorado Department of Transportation does not publish statistics highlighting the involvement of semis in serious and fatal car accidents. However, they may be worth examining in light of Colorado’s recent, overall surge in auto accident fatalities. 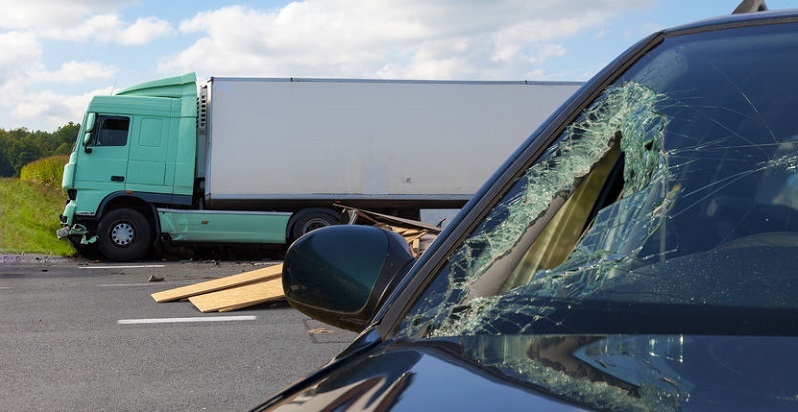 Figures from the National Highway Traffic Safety Administration show that large trucks in Colorado have a disproportionate and deadly effect on people around them. The federal agency recently published its deadly crash statistics for 2016. They show that 10 percent of the 884 vehicles involved in fatal auto accidents in Colorado were large trucks. Those accidents resulted in 86 deaths, more than 14 percent of the 608 people who died in traffic accidents that year. Only 13 (21 percent) of those 86 victims were occupants of the large trucks. The other 79 percent were in other vehicles, on bikes, or on foot. Ordinary motorists can reduce their chances of accidents with heavy trucks by learning more about the risks and driving accordingly. DOT has dropped its plans to require states to inspect commercial buses and passenger carriers. Congress directed the department to begin the process under President Barack Obama’s administration, the Associated Press reported. While 22 states already inspected buses annually, others say they can’t afford to follow such a mandate. In withdrawing its plans, the transportation department said it didn’t have enough data to show a need for the inspections. The United States has seen more than 220 commercial bus crashes and fires since 1990, according to Advocates for Highway and Auto Safety, which the Associated Press cited. The events caused at least 484 deaths and 4,618 injuries. Six days after Trump took office, the White House returned a proposed rule to the Federal Railroad Administration that would have required all trains to have at least two crew members. The rule has been moved from the administration’s short list for approval to the long-term agenda. The rule was inspired by a 2013 incident in Canada, in which one engineer failed to secure a train carrying oil. The runaway train careened into a town, derailed, and ignited a fire that killed 47 people. While most trains already carry two crew members, railroads want to be able to reduce crews as developing automation systems take over more control. The transportation department also struck a 2015 rule that required advanced braking systems for train cars carrying crude oil.